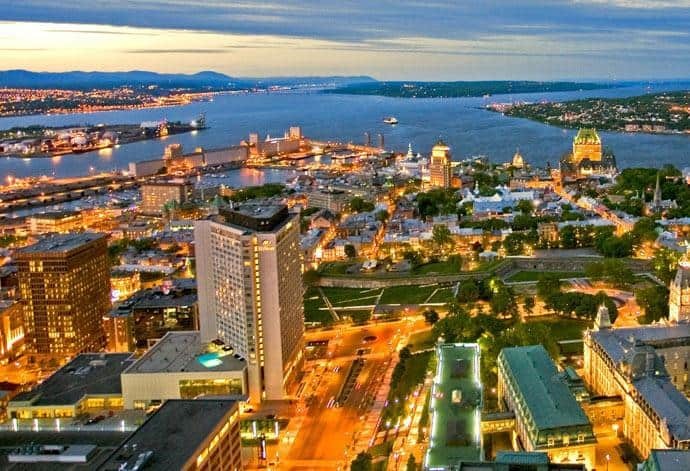 Quebec City is one of the most beautiful cities in the world, rich with history and vibrant with charm. It’s a great place to visit any season, and it is especially beautiful under a blanket of sparkling white snow, illuminated by sunny skies. While frosty weather might be intimidating to your average west coaster, the hardy Quebecois don’t balk at freezing temperatures – they embrace the cold and celebrate winter with gusto. 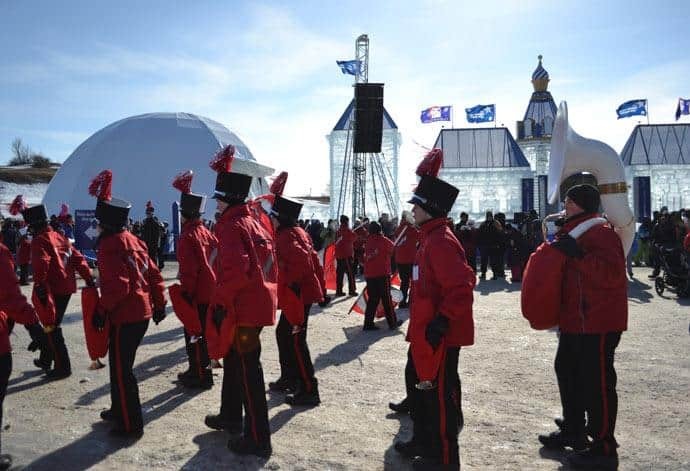 Case in point, the Quebec Winter Carnival, the “world's biggest winter carnival.” The event began in 1894 and was celebrated sporadically until 1955; since then it's run continuously – and continuously become bigger and better every year. The 17-day carnival, celebrating its 59th edition in 2013, spans three weekends around late January to mid-February, and was created to overshadow winter hardships and raise the city’s spirits. It’s done that and more. 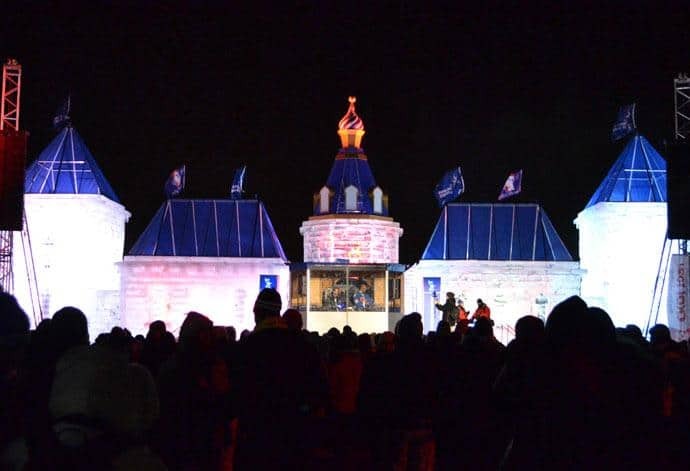 It’s grown to an internationally acclaimed event attracting nearly a million visitors from across the globe who travel to the historic city to marvel at the astounding array of winter activities and unique celebrations. Bonhomme Carnaval, or Bonhomme for short, was created in 1954 and has become synonymous with the event. The seven-foot-tall, 400-pound jolly snowman, with his signature red toque and arrowhead sash, isn't a mascot – he's an ambassador. A well-loved rockstar of an ambassador (complete with security detail) who is handed the keys to the city by Quebec City’s mayor in early January and gives them back at the end of carnival when Bonhomme returns to his alleged home at the North Pole. Greetings from Bonhomme, Joyeaux Carnaval! During Carnival, Bonhomme makes numerous appearances (see him busting a move on stage at the outdoor dance party above) and even visits local seniors and sick kids who are unable to come out and join the festivities. 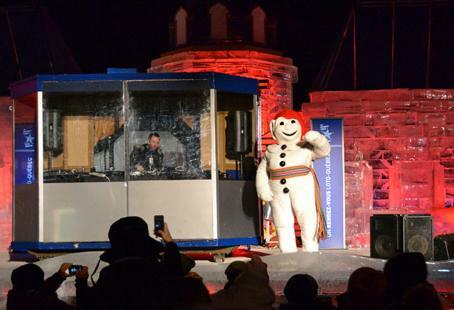 He’s committed to spreading the word about the Quebec Winter Carnival, and spends much of the rest of the year travelling around the world to promote the event. It’s no surprise Bonhomme is so proud of the Carnival, it’s truly a joyous occasion. 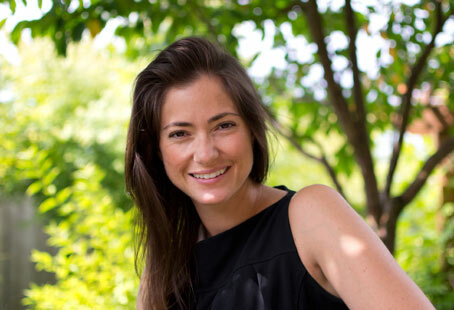 In fact, you’ll hear people greet each other with “Joyeux Carnaval” and it’s likely they’ll be wearing the arrowhead sash outside their layers of winter clothing. Also displayed on every festival goer is the effigy, $15, a plastic figurine of Bonhomme that changes every year and is the entrance pass to the Carnival sites. The list of events can get overwhelming when you set out to plan your Carnival experience, there is so much going on! Click though for seven highlights that will surely have you saying Joyeux Carnaval too. 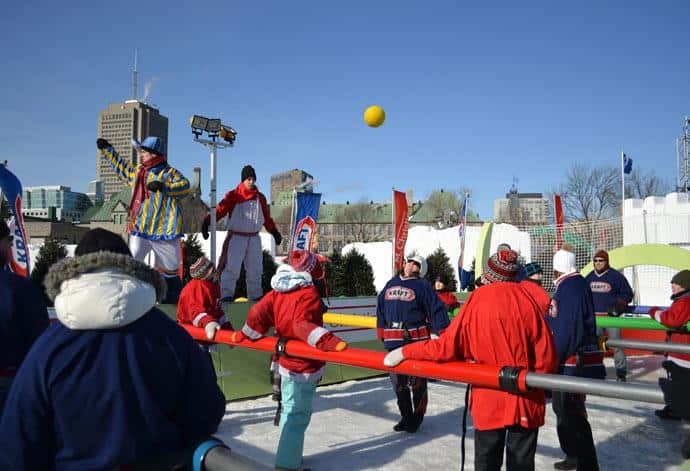 The 2014 Quebec Winter Carnival runs January 31 to February 16 – visit the website for details. If you’re in Quebec City this summer, check out the New France Festival, held each August. 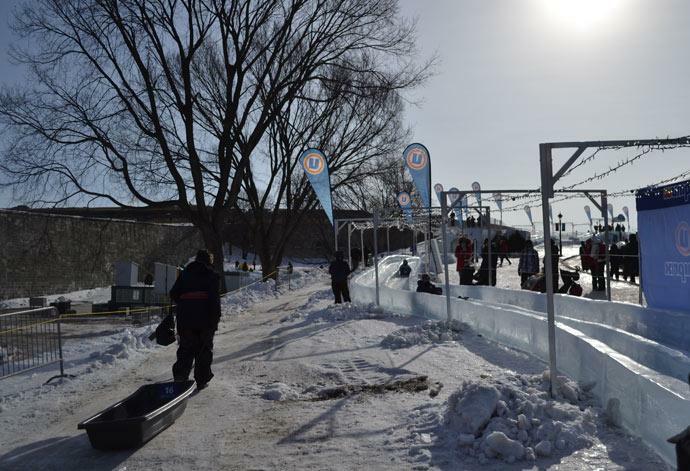 When you enter the carnival’s main site at the Plains of Abraham, you’ll immediately see the 120-metre-long Uniprix Ice Slide. Line up for your sled, carry it to the top of the slide, and get ready for a thrill as you fly down the icy track! 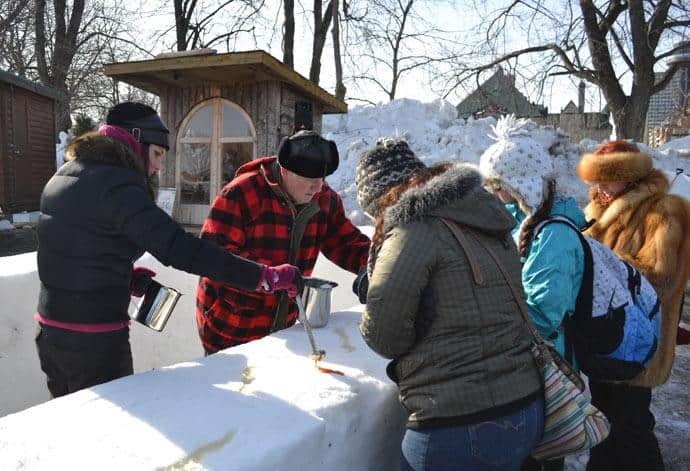 Head to the Sugar Shack for a quintessential Quebec experience – rolling up a ball of maple syrup taffy poured on the snow! Wash down this sticky sweet treat with a steaming hot cup (or red plastic cane) of Caribou, a delicious alcoholic beverage made from brandy, vodka, sherry and port, sold at SAQ kiosks onsite (SAQ stands for the Société des alcools du Québec). 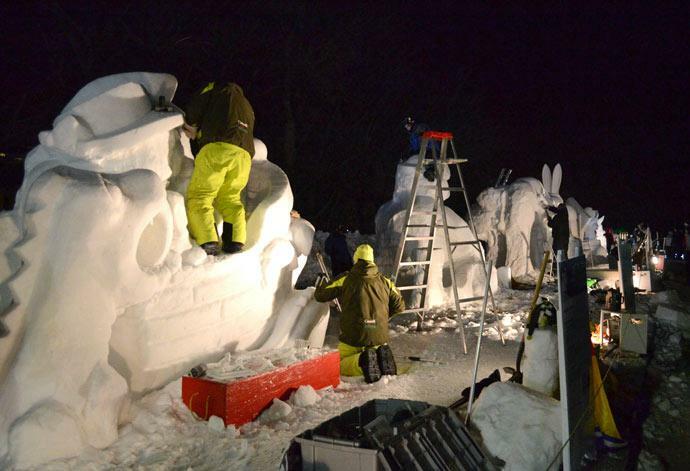 The TELUS International Snow Sculpture Competition features local, national and international artists carving massive, intricate sculptures from blocks of snow, by day and night. Carnival director of operations Daniel Bouchard says that 1,600 blocks of ice, shipped from Montreal, were used to build Bonhomme’s Ice Palace. 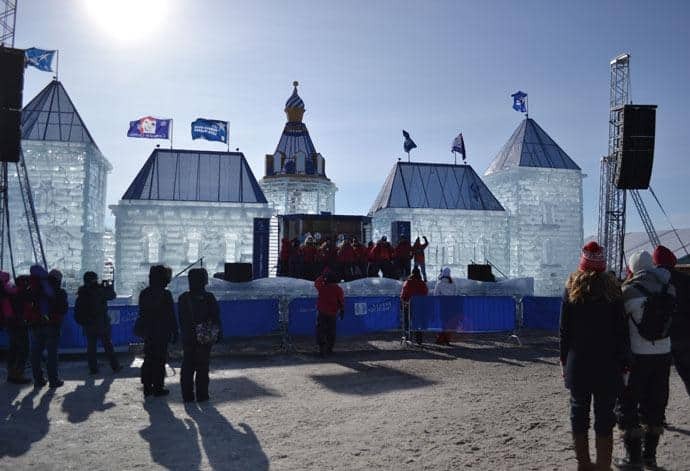 Each year the festival incorporates inspiration from a guest country and this year Russia’s influence can be seen in the architecture of the ice palace and in the enormous snow mural in the castle’s courtyard. Climb onto the giant foosball table, strap yourself onto the bar, wait for the referee to toss in the ball, and, along with your row-mates, try to score on your opponent’s goal. Spectators can’t spin your bar, you’re in control! This has to be one of the most gruelling sports in the world! The canoe race takes place on the St. Lawrence River, which, during the winter, is not only freezing cold but dotted with treacherous chunks of ice. Participants wear a boot with spikes on one foot to propel them through patches of ice. Watch the video below as Rick Mercer gives this extreme sport a try. It’s hard to imagine hundreds of people packing a snowy dance floor when it’s minus 20 degrees Celsius, but that’s exactly what happens at the epic Outdoor Dance Parties at Bonhomme’s Ice Palace. On Friday and Saturday nights well-known DJs from across Canada spin electro-pop beats as guests jump around in their snowsuits, warm up by the fire, and swig hot Caribou. 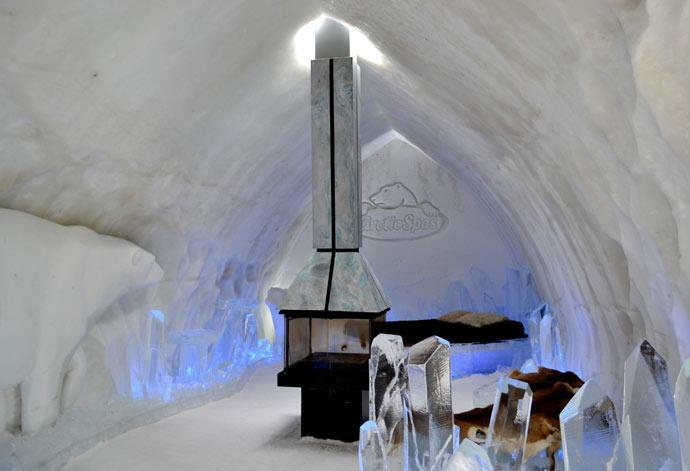 Built entirely of snow (15,000 tons) and ice (500 tons), the 44-room Ice Hotel is a must-see on your visit to Quebec City (one of the premium theme suites, with fireplace, is pictured at top). 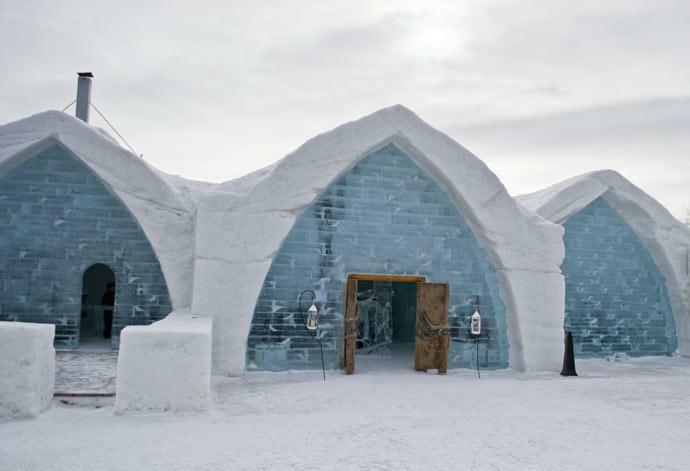 Rates start from $199 per person and include a welcome cocktail at the Ice Bar, a buffet breakfast at the Celsius Pavilion the following morning, access to the Nordic area with a sauna and hot tubs under the stars, and a super-warm sleeping bag to snuggle into on top of your bed – made from a block of ice topped with a fabric-covered mattress. If you’re not feeling adventurous enough to spend the night, stop by for a tour, which is $17.50 for adults, $15.50 for students and seniors, and $8.75 for children. The iconic Fairmont Chateau Frontenac was built in 1893 and overlooks the St Lawrence River from its perch in Old Quebec. Winter is the perfect time to enjoy a bundled-up stroll along the adjacent Dufferin Terrace and a ride on the toboggan slide, located at the end of the boardwalk. This year, the 618-room hotel will celebrate its 120th birthday with a $70 million renovation, due to be completed early next year, that will see the guest rooms, restaurants and common areas revamped while maintaining their historic integrity. Rates start from $199 for double occupancy and include access to Club Frontenac, the hotel’s health club and fitness centre. 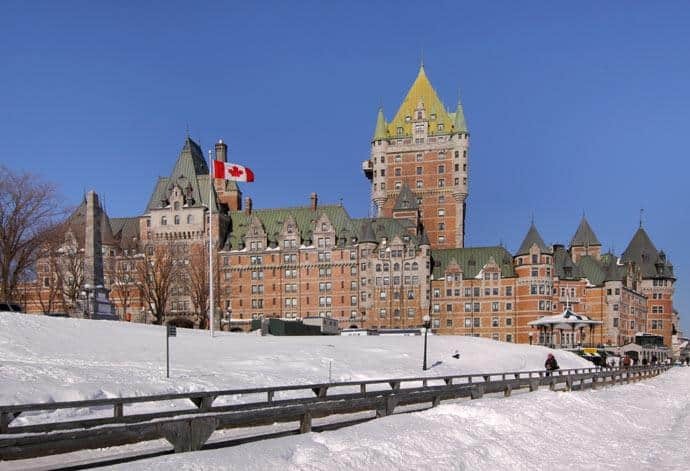 Every room at the Hilton Quebec, located less than 10 minute’s walking distance from the Winter Carnival, has a panoramic view of historic Old Quebec. Bring your workout gear and swimsuit so you can take advantage of complimentary access to the health club and year-round outdoor pool on the sprawling third floor terrace, and head to the 23rd floor for the executive lounge, with evening honor bar and complimentary hors d’oeuvres, or dinner at le23 restaurant. The Allegro restaurant, located on the main floor, is open for breakfast, lunch and dinner. Rates start from $179 for double occupancy.